EXPLORE BIGFOOT and CRYPTID VIDEO, AUDIO, WITNESS TESTIMONIALS and REPORTS FROM AROUND THE WORLD! Delve deep in search of mysterious creatures with The Paranormal Chronicles ever increasing BIGFOOT & CRYPTID archive including Video, pictures, audio, news reports and articles on some of the worlds most elusive and enigmatic creatures. There is so much Cryptid content on this page alone for you to enjoy with new information and reports added weekly. The Paranormal Chronicles is proud to present over 5 hours of exclusive TPCN Youtube video on BIGFOOT. Exclusive Pictures, witness testimonials and expert theories on this enigmatic creature. Watch now and enjoy the comprehensive study of this amazing subject. From all corners of the globe and from old and new cultures alike a secretive large, hairy, bipedal humanoid with apelike and human qualities is deeply interwoven into the fabric of their folklore. There are many names like Bigfoot, Almas, The booger, Cer Ra Ca Wa, Grendel, Hokou, Kakundaz, Pongo, Yowie and Yeti to describe this elusive and mysterious creature. In a world of technology constantly watching would definitive proof been discovered to prove the existence that the Human race has a spiritual cousin wandering the earth? Over the last few months, The Paranormal Chronicles has been interviewing experts in this Cryptid field to explore the notion that something incredible is not just a thing of folklore or the product of a hoax. During this investigation, we were presented with some incredible witness testimonials, pictures, and video footage and now we ask you to investigate our discoveries and make an informed decision on whether you believe such a thing can roam this world. The paranormal Chronicles presents two investigations for you to explore. Our second investigation and second video included the controversial video of an alleged un-categorized creature with some saying is mistaken for a misidentified animal and others saying it is definitive proof of a new creature…Could this be Bigfoot? Bigfoot researcher Dale Boswell discusses in depth the Video, his personal experience with Bigfoot and his theories behind the creature’s existence. Watch now the link below to ponder this startling footage. Your support is greatly appreciated and if you would like to be interviewed about your paranormal experiences or views for an upcoming broadcast then please reach out to us via email at paranormalchronicles@aim.com. Please Share, like and comment on your opinions. Your support motivates us to produce more content for you to ponder and enjoy. Here is more Bigfoot content! Below is a special extra with the TPCN Hellflix team looking at how BIGFOOT has been portrayed in the movies. Enjoy! Welcome, all to THE PARANORMAL CHRONICLES cryptid roundup. We have scoured the news to find intriguing and compelling creature sightings from around the world. If you have a cryptid sighting then please contact us at paranormalchronicles@aol.com or follow us and message us on Facebook at The Paranormal Chronicles. MOSCOW, Idaho (AP) — A northern Idaho woman told police she crashed into a deer because she was distracted by a Sasquatch in her rearview mirror. The woman told Benewah County sheriff’s officials that she saw a sasquatch chasing a deer on the side of the road while driving. She says she checked one of her mirrors to get a second look at the beast and when she looked up, the deer ran in front of her. Sheriff’s officials marked the incident as a vehicle versus deer collision but did not report any evidence of Bigfoot. Are sea monsters real? Loch Ness monster-like creature filmed emerging from the water! VIEWERS of a video showing a large “Loch Ness Monster-like” creature moving in water have questioned if it proves sea monsters are real.In the remarkable footage, said to have been filmed at a lake in China, a black shape can be seen surfacing through the waves. The shocked onlookers claimed it was about 16 to 19 feet (five to six metres) in length, as it did not completely come out of the water and all of it could not be seen. In the video, swimmers in the lake are heard to gasp as it seems to rear its head. Commentators have said it resembles the mythical Loch Ness Monster, but this was filmed thousands of miles away from Scotland at the Mount Lu Xihai Resort in Jiujiang City. The video has been seen by more than five million people on social media. But, one wildlife expert said it was likely to be a Chinese sturgeon – a critically endangered fish that can grow up to 16.4 feet. He suggested it had escaped the Luoping Sturgeon Farm which he said had operated for eight years – more than enough time for the specimen to grow to the length of the mystery creature. Marine scientists who flocked the place suspected it could be a giant squid or a sperm whale. Mysterious objects and creatures always pique people and make them curious to know what it is and are not at rest till they do so. Recently, a big mysterious creature was washed ashore in Indonesia and people can’t really understand what it is. According to a media report, the dead remains of the animal washed up on Hulung beach in Indonesia was clearly not a commonly spotted whale. A local, Asrul Tuanakota first spotted the creature on the shore but it eventually attracted a lot more people. The 15-metre long creature weighing approximately about 35 tonnes floating in the water also ended up making it red and also a public spectacle. Marine scientists who flocked the place suspected it could be a giant squid or a sperm whale but several reports say otherwise. However, a Lee Kong Chian Natural History Museum officer said that the carcass is mostly that of a Baleen whale but the reports are yet unconfirmed. After months without a sighting, the Loch Ness monster appears to be back and ready to be found. For eight months there were no reports of the mysterious creature in the Scottish lake, prompting concerns the infamous ‘monster’ was dead. But like buses, two have now come at once, as within days, two tourists have take videos of a creature that could be Nessie. This video shows what looks like a head and a long neck poking out of the tranquil water in the Scottish loch. It was spotted by Rob Jones, 35, from North Wales, who uploaded the video to YouTube to find out if anyone knew what it was. On May 2, a tourist took a picture of what she believed to be Nessie, the first recorded sighting since August last year.Hayley Johnson, from Manchester, noticed a strange and dark shape at dusk in Urquhart Bay, near Inverness, Scotland. It delighted Gary Campbell, Nessie’s official sighting recorder, who had become concerned after a spell without a spotting. With Rob’s video being taken on May 7, it makes two sightings in five days.But viewers on YouTube were more sceptical of what they’d seen. Reports of two six-foot monkey-like creatures calling out to villagers in Bachok, Kelantan, has left them in a state of utter panic. PETALING JAYA: The myth of Big Foot lives on – at least for folks in a village in Bachok, Kelantan, who fear two larger-than-life mammals are terrorizing them nightly with their evil ways. According to The Star Online that quoted an article in Sinar Harian, most of the villagers now scurry home as darkness descends upon them and stay indoors all night for fear that the two Big Foot will harm them. Some have said the creatures have been heard calling out the names of villagers, and those who unknowingly respond have battled inexplicable fevers for weeks on end. News of the two Big Foot spread like wildfire when a villager, Zubaidah Abdullah, 50, claimed to dream frequently of two six-foot monkey-like creatures who emerged from a big tree behind her mother’s house. “I was shocked that I could communicate with them. Sometimes I felt like they were sleeping next to me,” the news report quoted her as saying. Zubaidah also said the only way to scare them off was by reciting religious verses. She said her siblings were also tormented by the same nightmares.The services of a spiritual healer have now been sought to restore calm to the troubled village. A MAN has posted a video online claiming it is “the only proof of Bigfoot” – but there’s a catch. In the clip, Peter Caine, from New York, reveals what he says is the head of “Sasquatch” – a large, hairy creature from American folklore. On camera, Peter examines the head of the beast, claiming that his dad, Mike, had captured it in 1952 during a hunt. He added that since then, the 120lb head had been stored in a freezer. But fear not, it may not be the mythical ape-like terror after all. Peter, who is a dog trainer and comedian, has a history of posting comical videos and viewers were quick to debunk the Bigfoot theory. The video was uploaded yesterday to YouTube on Peter’s channel with the title “Bigfoot head, frozen since 1953. The only proof in existence of Sasquatch”. Racking up over 27,000 hits, others were still in amazement with some thinking this is finally the proof needed to solve the mystery of Bigfoot. And Peter himself was adamant about the head’s legitimacy. California farmer claims to have spotted a BIGFOOT family-of-five running on his orchard – and one was carrying a pig. A California farmer claims to have witnessed the latest Bigfoot sighting after spotting five of the creatures running near his ranch. The farmer, identified only as Keith, claims to have spotted the Bigfoot near Avocado Lake in Fresno County. He recounted the story to Jeffrey Gonzalez who runs the talk show Paranormal Central. ‘I’m going up the road and all of a sudden these five bodies, whatever, run past the front of my headlights on my truck,’ Keith said. He said he believes it was the legendary Bigfoot. Gonzalez told Fox News that one of the Bigfoot spotted by the farmer was supposedly carrying a pig. ‘One of them, which was extremely tall, had a pig over its shoulder. The five scattered and the one with the pig was running so fast it didn’t see an irrigation pipe and it tripped, with the pig flying over,’ Gonzalez claims. Gonzalez, a self-described paranormal expert, said there have been two other Bigfoot sightings in the same area in the last five years. He has a photo of one of the sightings that claim to show a Bigfoot running through an orchard. Gonzalez also says he has what he describes as a footprint mould belonging to a Bigfoot from the orchard. Gonzalez claims a woman told him that her two sons saw a Bigfoot in their orchard. A few years later a man called him to say he saw five Bigfoot in the same orchard across from his house. ‘What are the odds of three people, three different families, who don’t know each other, within a radius of 2 to 3 miles, come and tell me what they witness, and it matches up,’ Gonzalez said. Others called it an ‘underwater monster’ and the tour group’s very own ‘Daintree monster, like Nessie!’ Queensland is renowned for its mystery creatures with reports of Yowies, Bunyips and giant cats all notoriously sighted in the state. Police in South Carolina is warning cryptozoology enthusiasts who think they’ve spotted Bigfoot, not to take potshots at the creature. The pair can be heard swearing with incredulity when they see the creature lurking in the forest. But they are forced to run after a gunfire like a bang can be heard in the background. COULD this video show the legendary Bigfoot primate conclusively caught on camera for the first time ever? Bigfoot hunters claim this could be the clearest video yet of the mythological creature.The footage is said to have been taken during a family trip to Oregon state in the US.It shows a man talking to the camera as he is next to Wildhorse Lake in the Steens Mountains. The dad is also shocked as he says, “Wow what is that?” before someone says it’s a bear. Bigfoot is the name given to a mythological simian, ape, or hominid-like creature that is said to inhabit forests of the US. It is similar to the Yeti said to inhabit the Himalayas. The video has been discussed on Bigfoot hunting conspiracy theory websites as possible conclusive proof. Others have said it is a fake, involving someone wearing a suit. MYTHICAL creature hunters have claimed that the elusive Bigfoot may have made a home in Britain. Chilling accounts of the UK’s own Bigfoot are fairly common, and many claim to have spotted a glimpse of an ape-like creature roaming the countryside. It comes just months after a photographer told Daily Star Online that he may have captured the first ever footage of a Bigfoot roaming the British countryside. While investigating a string of sightings at Bolam lake near Newcastle in Northumberland he claims to have seen a man-like person leaping through a bog. Jon, who investigates sightings of monsters as a cryptozoologist, added that there’s no way what he saw in 2003 could be a person because of the way it moved through the bog. And it isn’t the first time people have claimed to have an encounter with Britain’s own Yeti. Earlier this month massive ape-like footprints with claws caused a stir in Manchester when a dog walker spotted them on the outskirts of the city. Jon works as a cryptozoologist for the Centre for Fortean Zoology and regularly investigates animals which are thought to be extinct and not exist at all. But even he was completely shocked by this sighting. He said: “The chances of there being a Bigfoot in Britain are almost nil, and yet people keep seeing these things, including me. Jon is almost certain that what he saw was something paranormal, but he believes that whatever he saw might also be what others see when they spot a Sasquatch. More footage of Bigfoot-like creatures has been spotted all over the world, including walking through a waterfall in Indonesia. Strange creatures that appear to have a cat’s head and rat’s body has apparently been discovered by a terrified family who called their local church leader to kill them. The animals were found in a house in Lethabong, Rustenburg, in South Africa. Locals believe the creatures are cursed, according to reports, after their origin couldn’t be explained. Maxine Caulfield said her mutts used their ‘sixth sense’ to seek out the creepy figure among the trees as they walked through Slieveanorra in County Antrim, Northern Ireland – rumoured to be haunted by a fatal plane crash. Footage shot in the south-east Asian country appears to show an enormous creature walking upright through a waterfall and rolling green hillside. Some believe that judging from the height of the creature in comparison to the waterfall, the video is just one of the hundreds of fakes littered across the internet. It is unclear when the legend of Bigfoot, also called Sasquatch, was first created, however, most sightings are attributed to being black bears. Adding to the intrigue over this video, however, is the fact that the large bears are not found in Indonesia. But Mr Bremner said he is sure it is Nessie and shows a two-meter-long silver creature swimming away from the lens with its head bobbing away and a tail flapping a meter away, preparing to swim further on. And in 2001 a pair of fishermen spotted a dark 6ft long blob sticking there have been five other reported sightings of the monster this year which, including Ian’s latest, is the highest number since 2002. Some of Ian’s friends think this picture actually shows three seals playing in the water. Sightings were scarce until the first modern newspaper report of a monster in the Northern Chronicle of in 1930 which told of fishermen in a boat on Loch Ness being ‘disturbed’ by an 18ft (5.5metre) long creature. But it was a sighting in 1933 when George Spicer and his wife claimed they saw ‘a most extraordinary form of animal’ which was four-foot high (1.2metre) and 25 foot (7.6 meters) long crossing the road near the loch, that started Nessie mania. But in July 2015, a famous ‘monster’ hunter Steve Feltham, who spent 24 years watching the Loch, made global headlines, by declaring that the creature – or creatures – in the loch were probably a Wels Catfish, native to waters near the Baltic and Caspian seas in Europe. Their theory has yet to be proved. The creature will, therefore, be taken for more analysis to the regional capital Yakutsk, a city 1,686km south of the Udachnaya diamond pit. Other hypotheses about the little monster’s potential origins are that it might be a wolverine, a carnivorous mammal resembling a small bear or a marten – another slender, agile mammal living in the snowy forests of Siberia. It comes just months after pictures of a similarly-deformed piglet were taken in the village of El Galpon, in the northwestern Argentine province of Salta. The latest image was snapped by the Murillo family who has a pig-rearing business in the coastal city of Los Mochis in Mexico’s north-western state of Sinaloa. The farmers said they were shocked when they discovered the newborn piglet and decided to share an image of the animal online, where netizens started widely sharing it. The Devil Hound? Could such a creature exist? In the field of the paranormal, it’s not unexpected to receive a frantic phone call early on a weekend morning. One can never assume that you can merely plan a day off without the apprehension that someone, somewhere in the county is experiencing a paranormal incident that defies their rational thought and that they need some help to come to terms with what they experienced. This is why I investigate, it’s that feeling of expecting the unexpected that fuels my desire to uncover truths. The paranormal chronicles and its sister site Pembrokeshire Beyond have documented accounts of an Owl man, a Phantom hitchhiker (Please feel free to explore our archive on this website), roadside hauntings, published an account of a terrifying haunting in A most haunted house and even had to interview people who claim they have had paranormal sexual relations. One man even claiming a demon stole his seed (click here to read: http://wp.me/p43eJ5-26) but on this morning we had something a little different to contest with: The Devil Hound. Vivid Imagination or could something be stalking the countryside of Pembrokeshire? 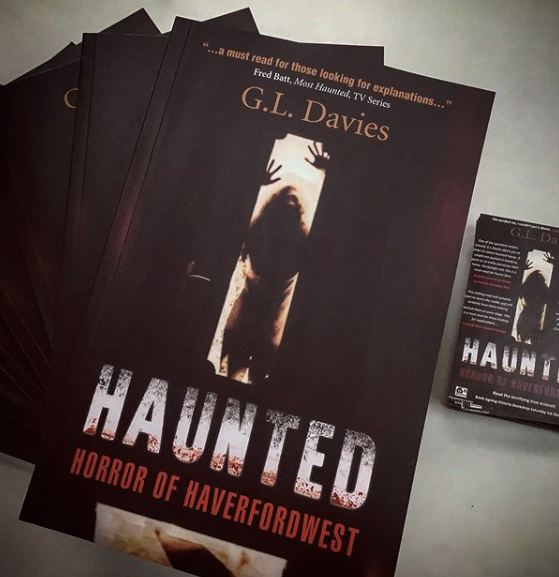 Having lived on the Outskirts of the peaceful town of Narberth, Pembrokeshire a few years back, I had heard, drunken talk about a large black red-eyed dog called the Devil Hound. Larger than a domesticated canine this beast was said to roam the fields and valleys around the area surrounding the crematorium. No picture of evidence has to my knowledge ever been produced and as far as I was concerned it was just a local legend, a startling myth. Most areas have such creatures and Pembrokeshire has its fair share of big cats, strange and cruel hairy goblins and even a dragon. Narberth, Pembrokeshire. A wonderful place to Visit. The origin of the creature is unknown but a local farmer was kind enough to divulge that when he was a young lad growing up in the area in the 1950’s a series of brutal slayings had been reported of sheep.One sheep carcass found ripped to shreds high up in a tree another’s innards spread over half a mile of road. He always believed it was the Devil hound; a cruel creature cast out from the pits of hell to roam the green fields of Pembrokeshire causing terror to the good hardworking folk that lived there. He joked that it has been sent from hell to remind us that the devil cherished our soul and that we needed to hold on dear to our faith in Christ. Then in the 1980’s a man travelling the road on his moped claims to have witnessed a large black dog with large coal red eyes and a large mouth drooling smoke or stream in a gateway. The man was so terrified that he lost control of his moped and nearly crashed and was mortified that his small bike could not carry him away from the beast quick enough. On Friday 8th August 2014 around 8 p.m a car with four people aged between 18 and 22 claims that while driving on the Amroth Road (A477) they saw a large black dog with red eyes bound across the road and disappear into the Pendeilo woods. They insisted that it was not the Big Cat that is often reported in the County but definably a dog, much larger than any domesticated canine they were aware of and its movement and eye colour were certainly distinctive. They declared the creature to be pure black, red eyes and a steam or smoke rising from its body. Could the Devil Hound be on the move? Looking for pastures and prey new to feed upon? The area in which the alleged creature has been seen is vast and is home to many woodland, valleys and fields. Then I had a frantic call from a lady who was given my number by a colleague saying that while she and her daughters had been out riding their horses near the llanmill valley they saw a large black dog with red glowing eyes and steam or smoke rising from its back and head. It was large, larger than a normal dog and its presence disturbed the horses that then tried to turn back. The three witnesses’ watched in puzzlement as the dog looked at them, made a strange hissing noise and leapt into the undergrowth. The mother was unsettled but had the wits to dismount and take a picture on her phone of a footprint of the proposed beast and put a BIC lighter next to it for scale. Devil hound or just a normal big dog print? But Steve Feltham, 52, is going to upset fans of the paranormal, folklore and mythology, as his conclusion more than two decades on is that it is probably just a huge catfish. The Wels, or European catfish, was introduced to the lock-in Victorian times to give fishermen a trophy specimen.The non-native giant can grow to 13 feet and has an almost sea monster appearance. Despite the realisation, he was chasing a more mundane explanation, he said: “I certainly don’t regret the last 24 years.” And he still lives in a caravan on the shore of the lock selling Nessie nick nacks to tourists. A group in North Carolina is claiming they have evidence that Bigfoot exists. The group North Carolina Bigfoot has posted photos they claim to be evidence of Bigfoot, including footprints and bent branches, over the years. North Carolina Bigfoot claims evidence of Bigfoot sightings have been found in Pender County, the Uhwarrie Forest, and Lake Hickory. The fascination with Bigfoot is also spreading to North Carolina classrooms. Instructor Jim Charneski offers the class North Carolina Bigfoot at Mayland Community College. He began teaching the class four years ago. Charneski said he became involved with Bigfoot Research Field Organization ten years ago and now serves as an investigator for the organization. According to Charneski, the class covers Bigfoot history in North Carolina and Bigfoot research and investigations. He said the television show ‘Finding Bigfoot’ has brought more attention to the topic. Charneski said he had a sighting of Bigfoot approximately four years ago near the North Carolina/South Carolina border. He is hoping to offer similar classes in the Asheville area and encourages people to keep an open mind about Bigfoot sightings. Stefan Jagoe with the NC Bigfoot Facebook page said this is a footprint in mud found in March of 2016 after a sighting. Jagoe said this was an unusual tree formation found deep in Uwharrie Forest. “Other than humans, nothing in the forest has this type of dexterity,” Jagoe said. “Unusual tree bending requiring great strength and dexterity near Lake Hickory, NC,” Jagoe said. Jagoe said the photo shows a track found in Uwharrie. “We follow-up on the evidence,” Newman said.Some of the evidence that is tested is hair samples, he said. “You will never hear me say it was 100 percent Bigfoot — but you will hear me says it is interesting,” Boles said, referring to the evidence. Moneymaker said the creatures like to use sounds to intimidate and typically run in groups of three.“They adapt and specialize in sneaking around in the dark and grabbing deer,” he said. Want to read more? Click the image below! 6th Books is a leading publisher of Body, Mind, Spirit books. 6th books publish titles on the paranormal, consciousness, parapsychology and the afterlife, working in partnership with authors to produce authoritative and innovative books. 6th book authors offer wisdom from ancient teachings, with new perspectives and interpretations. Enjoying reading? Enjoying building knowledge on this wonderful subject? Visit 6th-books.com and explore the unknown today. Looking for more? Watch now!